In the middle of Lake Ilinalta, on an island directly north of Falkreath. 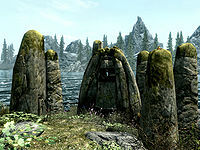 The Lady Stone is one of the thirteen Standing Stones scattered across Skyrim. 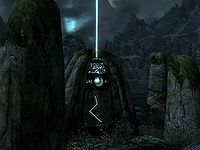 Activating the Lady Stone provides the player with a 25% boost to both health and stamina regeneration rates. It can be found in middle of Lake Ilinalta, on an island directly north of Falkreath. There are a few upright stones flanking it and many red, blue and purple mountain flowers on the island and around the stones. You will also find many monarch butterfies and blue butterflies during the day and luna moths and torchbugs in the evening and at night. The lake is home to slaughterfish which will attack if they see you. The treasure chest for Treasure Map X is located underwater just east and slightly north of the stone. The loading screen for The Lady Stone implies the stone provides a power rather than a constant effect ability, which is incorrect.